Much of my life is lived on facebook, but I know I have friends that don’t facebook so I owe you some sort of update. Life here in central Texas is dry. It is the worst drought since the 1950′s but it is worse in a way because so many more people live here now and need water. Our trees are showing stress. The lake by our house is at 50% full and is about 45 feet low. We are about to set a record (for all time) of number of days over 100. On the health news it is mostly pretty stable. I was well enough to attend my cousin’s daughter’s wedding in Colorado in June. I’ve swimming after dark, and loving it. Also got a long sleeve long pants spf 50 suit so I could swim in the day. Found out it has a lot of drag. Still I am in there for exercise so it probably doesn’t matter. Still dealing with the GVHD (my new immune system attacking my skin.) Also I recently got a couple of more twists. My last MD Anderson check-up indicated that my thyroid was low … could explain my thin hair and fatigue … I will be getting it checked again on Monday. Also on Wed my ophthalmologist informed me the cataract on my right eye is ready to be removed. A bit of a shock because it was correctable to 20/20 last year. Sigh. Because I am so dreadfully nearsighted and cannot wear a contact lens, she recommends that if I get one done I get both done. I guess it is a odd type of cataract … possibly accelerated by my chemo or steroids. On Monday I will ask my oncologist if he feels it is safe for me to have the surgery. The big upheaval here is that we are redoing the kitchen. My 26 year old German cabinets (which were laminate over particle board) despite being well built were really showing their age. The counter laminate really did need replacement. My 26 year old oven was intermittent. Given the houses view, the Anderson windows and quality construction, the updated bathrooms and the pool I figured if we sell the house the buyers will expect granite counter tops. So, taking cousin John Beattie’s advice, we decided to update now when we can enjoy it and hopefully it will still be good when we are ready to sell the place. 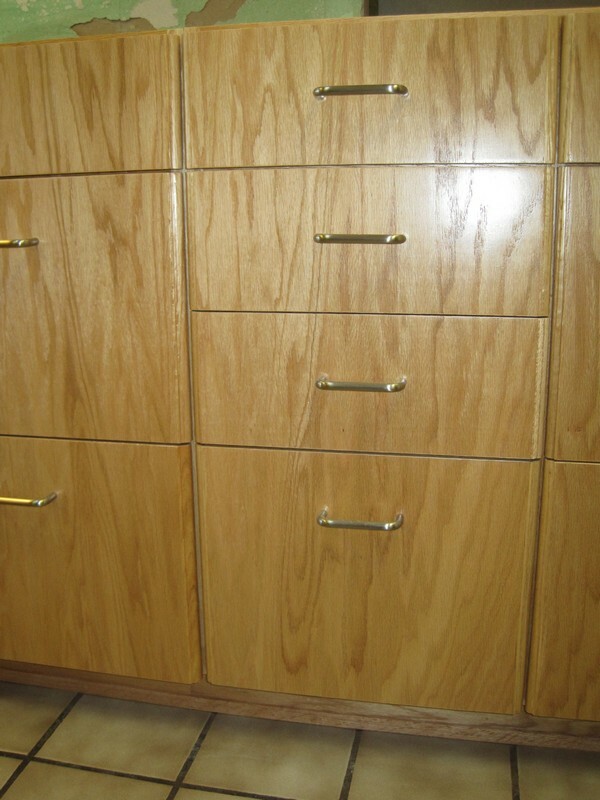 The new cabinets are similar to the old ones but are red oak with a clear lacquer finish. We will get granite and an under mount sink. I also got a new 30″ Kitchen Aid double oven with convection. We will reuse the cook top, dishwasher & refrigerator. The layout is almost the same but we got rid of the trash compactor because now that we recycle we find we don’t use it much. 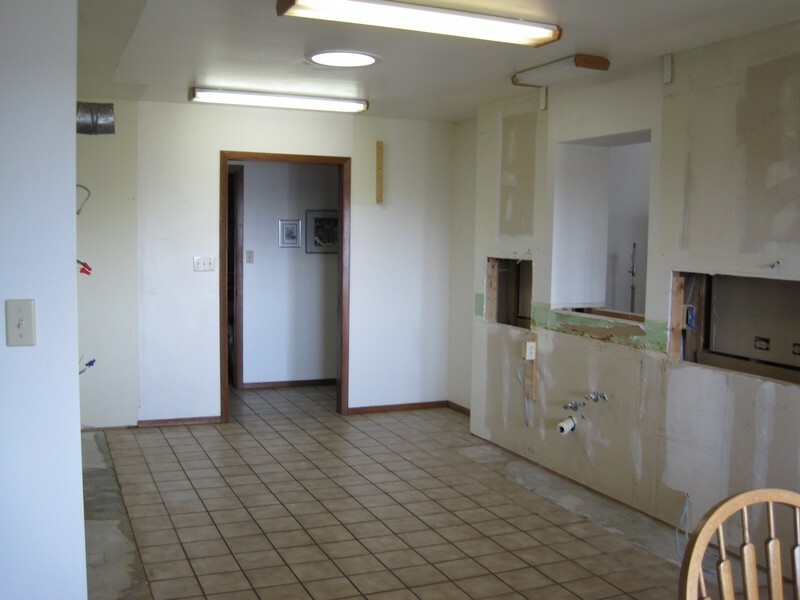 The kitchen has been torn up for about a week and a half. 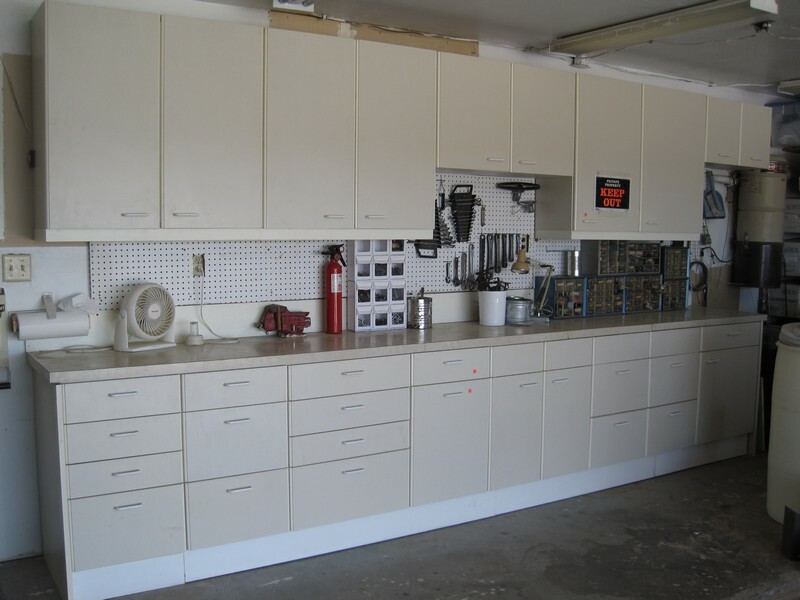 Ed gave many of the old cabinets new life in the garage. The granite should be installed next Friday. 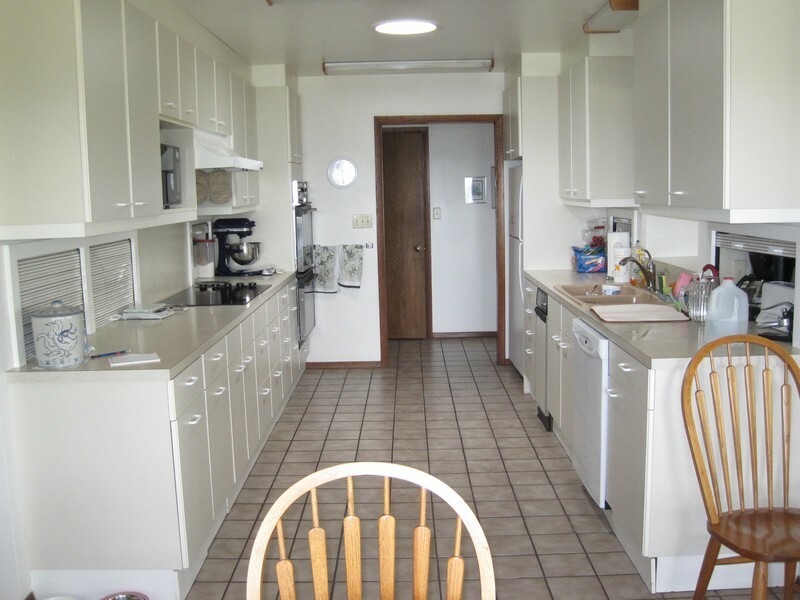 Then they will come back and finish redoing the appliance garages, intstall the remaining appliances, tile the backsplash behind the cooktop, and trim and touch-up. 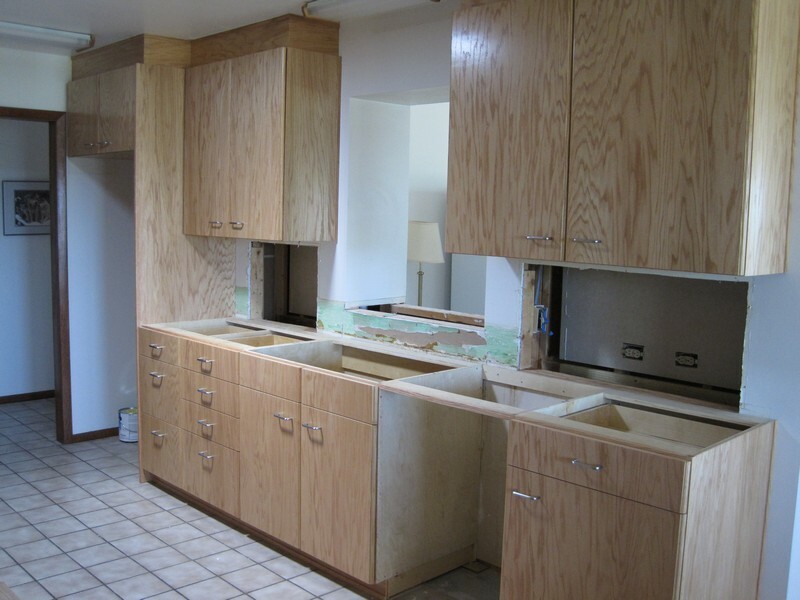 I am guessing the kitchen will be partially functional in a little over a week, and finished within 3 weeks. Ed, Ben and Joe (a contractor) installed the double oven today. 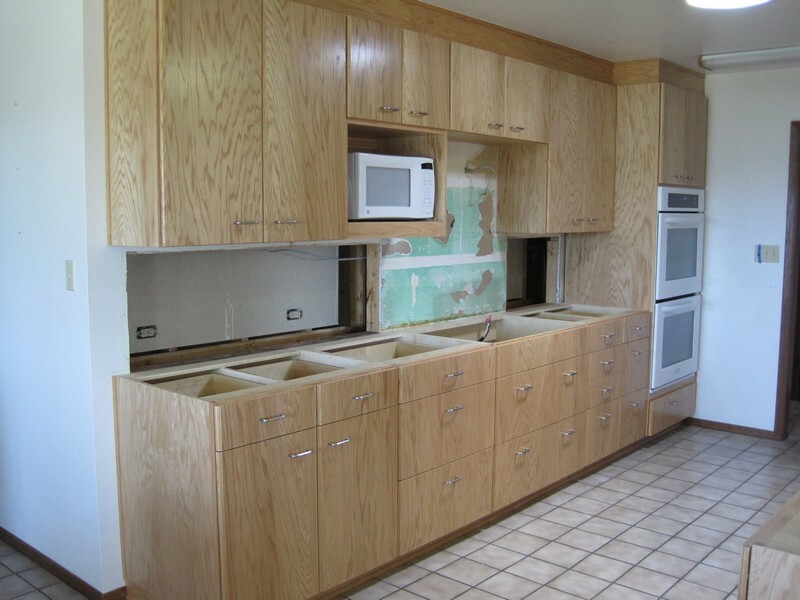 Here are photos of the process … I promise to post a photo after the granite is installed and again after it is done. First the old kitchen if you don’t remember what it looks like. What doesn’t show is the chipped and worn laminate, the broken and nicked toe kicks, etc. I like how they matched the grain on the drawer fronts. Wowie Zowie! Everything looks wonderful! I hope you are enjoying them! I wish I could say that I have low thyroid to explain my thinning hair and tiredness!! These photos don’t exempt you from an open house to view them. Fun with Jewelry glass fusing, wire, stringing and life here on the hill.